A unique Owyhee jasper necklace with a wonderful dust storm or even a desert tornado look giving it a southwest feel! This design was created to give the feel of clouds in the sky over a dust storm in the desert. 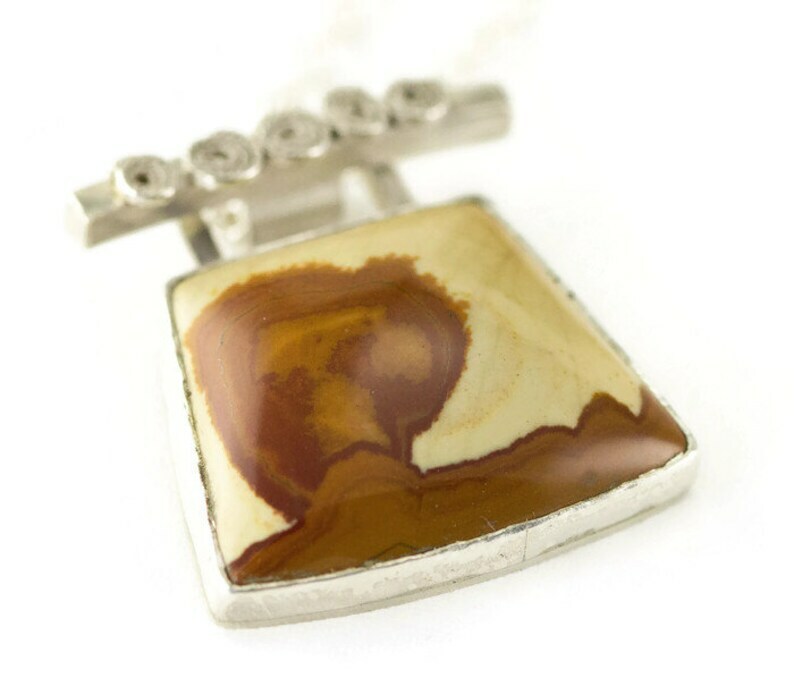 This one of a kind picture jasper pendant was entirely hand fabricated using heavy solid sterling sheet, and a fine silver bezel. The back is hallmarked .925. I added filigree swirls to the bar above the setting for my clouds and attached a hidden tube bail to the back. The lovely cream and brown earth tones in this stone will make it a wonderful accessory to so many things in your wardrobe. This pendant is ready to ship, necklace length can be made same day and shipped same or next day. Need a holiday wrapped gift shipped direct to your recipient? Choose gift, add gift wrap and I will credit the gift wrap amount back to you through December 18, my last day to ship first class. This is not an overly large pendant, but has substantial weight from the solid sterling sheet and accents. Necklace is shown with a polished finish but I am happy to oxidize at no additional charge. If you need a longer or shorter chain, just contact me before purchase. Chains over 20 inches will have a small additional charge and all will come with the 2 inch extender. Your necklace will ship in packaging suitable for gift giving. I provide a gift box, a drawstring pouch. Inside your pouch I include a plastic bag with anti-tarnish square for keeping your jewelry protected and a square of Sunshine polishing cloth to get that extra sparkle before wearing.